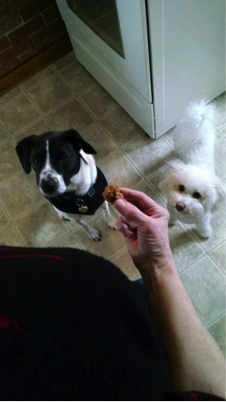 Bark-A-Licious, created by Judy Foster, is an all-natural, homemade dog biscuit business located in Rochester, New York. 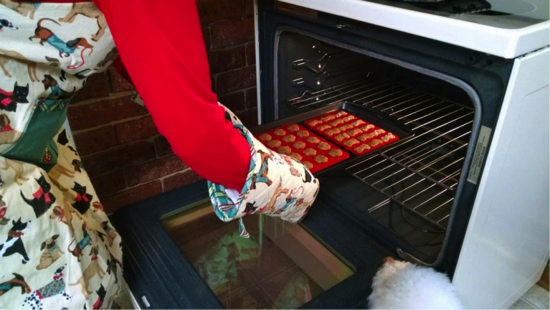 Judy’s unconditional love for animals inspired her to start Bark-A-Licious, in hopes to make the pups who enjoy her treats that much more healthy. Judy graduated from Escoffier Online International Culinary Academy from the Culinary Arts Program in February 2015. Escoffier was part of her journey. 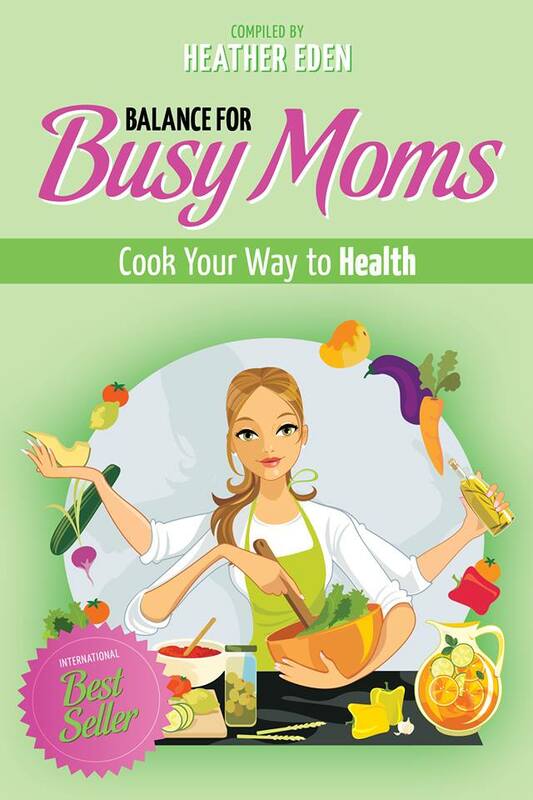 Judy wanted to make sure she was formally trained in culinary methods and cooking before starting the business. Her experience in the kitchen and love for cooking is what sparked this new, local business. Judy is also certified in food safety by ServSafe. This was also an important part of her cooking journey. Judy is currently taking the Healthy Baking program classes through Escoffier to learn more about different healthy food options and to incorporate into her biscuit choices. The future holds a potential gluten-free biscuit option. Now there are 6 different options of biscuits dog owners can choose from Bark-A-Licious. When putting the list together Judy thought about what dogs would like for a more standard biscuit but also “dessert” type biscuits. The more standard biscuits contain a combination of homemade chicken stock, oats, and whole wheat flour. The dessert types contain any of these items from honey, peanut butter, to bananas. Judy learned to make the chicken stock through her training with Escoffier. 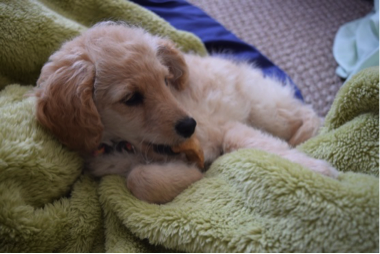 Bark-A-Licious biscuits are enjoyed not only by dogs, but ferrets, and even humans! 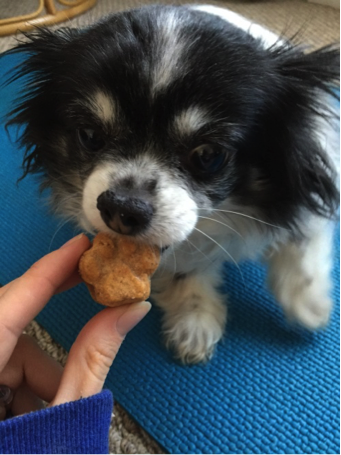 Her treats are healthy, all-natural, preservative free, and of course, tasty! Consider ordering Bark-A-Licious biscuits. They are becoming more and more a household treat for many dogs. Look around you. Most likely you are sitting in a room that resembles some type of square or rectangle. A box. My first time in an airplane, I could not get over the fact that almost everything that I saw sliding by beneath me was all in perfect little grids. Roads, buildings, fields, barns, everything man-made was in squares and little boxes. Our lives are sectioned out and organized all around us. So, a shape and concept that surrounds us SO frequently becomes the way we think. In boxes and controlled environments. When your brain is told to: "Think OUTSIDE the box," what is your reaction? Yikes! Something UNFAMILIAR (scary I know!). We have to abandon what we are used to and think beyond things we can see and touch in front of us. God has given our brain an amazing memory and creative capabilities. If I ask you, "what is your favorite thing to do when it is raining?" Your mind probably goes a million different places, thinking of memories and ideas that we associate with rain. For me, when it's raining, I enjoy going out and standing in the rain. It is relaxing and very peaceful (as long as there is no lighting)! My point being, our minds are amazing and they frequently have to retrieve information to live life. What if we have a task before us like cooking, that has a creative side to it? Our brains get to come up with new, innovative, previously unknown ideas! Fun right? Hopefully it is to you. I like to distinguish cooking into two different areas: Logical and Creative. There is the logical side of things which require measuring, weighing, portioning, technique and precise control. I think bakers are often more logically minded. Very Mathematical. Then there is the creative side of things. Color, contrasting flavor, experimenting with the unknown, improvising, creating. Both are needed and used in cooking. Most people tend to be either a "logical cook" or "creative cook." Have you been called "a dumper" before? Then you just might be the creative type. The person that follows the recipe as law would be the logical cook. Join the fun. Share your creation @HannahsFood #creativecook or #logicalcook ? Before I went to culinary school, I was a "dumper." What I cooked was either great, or a flop. Learning proper cooking techniques and teaching myself to follow very specific recipes helped me become a more accomplished creative cook by leaps and bounds. Why? Because you have to strengthen your weak areas so that you can have a more balanced approach. I am now studying food science and every little nitty gritty baking concept because now I love the "why" behind baking soda vs. baking powder. That's another topic for another time though. A well balanced chef is both creative and logical, trying brand new things meshed with proper technique. Don't be scared when you are encouraged to "think outside the box." Like any skill, it takes practice. Think fresh, without limits. Let your brain take time to imagine and think OUTside the box without defined boarders. Write your ideas in your flavor journal and try them out. Creativity + logic = ? Cooking is not the only area in life where the logic and creative approach comes together. Being a musician, I am often boxed into measures, phrases and rhythm. However, within the constraints, it is up to me to bring an experience to the listener by interpreting all the dots on the page in a meaningful way. 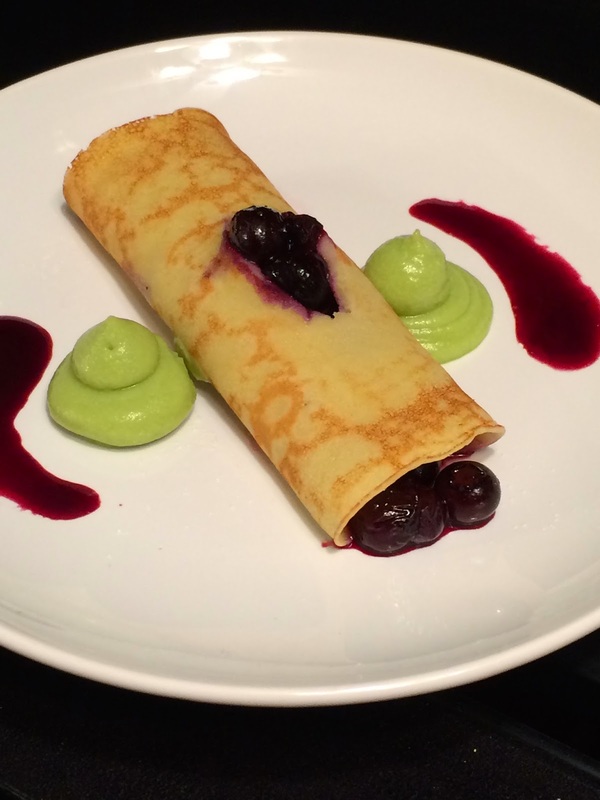 Dessert Crepe filled with Aged Blueberry Balsamic Compote and Avocado Mousse on the side. Everything has a design. This world is not by chance but by awesome design. God made it a part of us to want to design and create to further the parts of this world. There is nothing else quite like creating something. "If I asked each of you to create a dish right now, it would be very hard to come up with a new concept and make it happen. However, if I asked each of you to take the concept of the omelet and come up with a variation on the dish, you could each easily do so." His point was, to start from a blank canvas is challenging. Varying something already existing is maybe not simple but definitely more doable. Creativity is my thing. Once as I understand the technique behind my idea and know how to implement it... look out! Every part of life gives me ideas for dishes. Not just something in the pantry or something I have eaten before. Here is a list of things that consistently give me ideas to write in my flavor journal. Don't have one? Read about mine here. Let's stop right there. Sound. Being an improvisatory musician I am always wondering, how would the color of bright orange sound? How does spring air and freshness sound? How can I compose in a way that brings on tone that expresses those things. Now, what if my compositions were expressed through food? Wow. How would the sound of Mozart "taste?" What about the sound of a hollow forrest in winter? Things to ponder for sure. Naturally, I am not a book worm ...unless I find a really good book on a really good topic. Lately I have found some good books and I have enjoyed reading them (over and over and over). Every page, the golden sentences jump out at me and tie together everything I have been attempting in the kitchen. Here are just a couple quotes from books that I have been reading this week. I believe they will be of use to you as they have been to me. "Success is a poor teacher. Baking is a craft mastered only through years of trial and error. It is important to remember to let yourself try and fail - it's only flour, water and time." "Every important lesson in baking has come learning from my mistakes. If you know how it can go wrong then you're well on your way to mastery." When you sit down to read a cookbook, grab your flavor journal. Don't have one? Make one! Mine is a small padded black notebook with white stiching on it giving it a very cushy comfortable cover. I have no doubt that it will be filled up soon and be "volume one" in a long line of flavor journals. Now that you have your flavor journal, take time to think about the flavors listed on the page before you. Envisioning what it would look like on a plate. What it would taste like in your mouth? 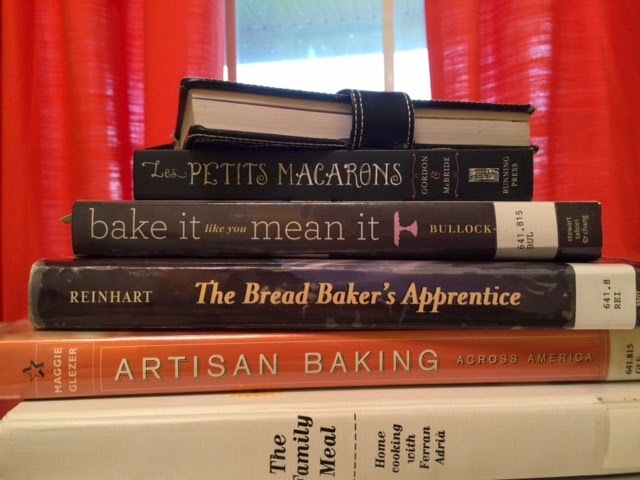 If a thought comes to your mind about how you can alter, improve or experiment upon the recipe before you, write it down (always log what cookbook you were reading and what page for easy reference)! That is a cherished idea and you don't want to forget it. Every idea is worth something. It may not be a stunning dish, but it could lead to a unexpected flavor revolution. Whenever possible, I make time to experiment and try out the ideas I have written down. Then I write down how it turned out, what I would do differently or not. Before you know it, you will have a great book full of ideas that are just your style, and that is what makes you unique. It is important to be able to replicate traditional dishes or a certain style... but in the end, people want to see your style. Be creative and be you.